A fanastic 14ft trampoline package suitable for younger children and smaller areas, now with FREE black powder coated ladder. THIS TRAMPOLINE CAN BE BUILT IN 45 MINUTES, 2 PEOPLE! 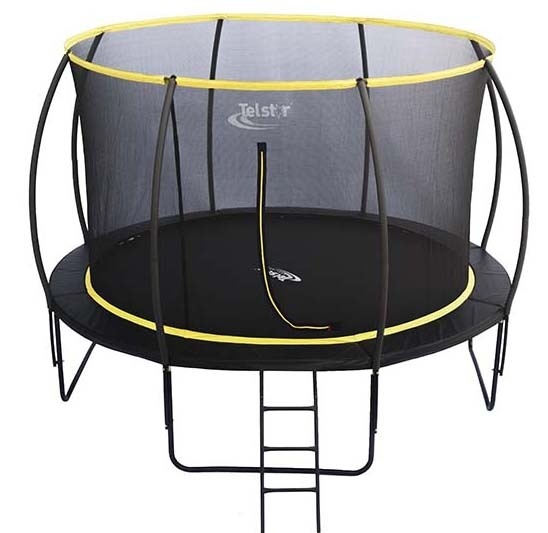 From years of developing trampolines for the garden with performance and safety in mind, the latest model to come off of the Telstar production line is sure not to disapoint. The enclosure net is attached to the safety mat during production, this not only makes the build time quicker it ensures the user is kept completely away from the springs as the bouncing area becomes totally enclosed. The top of the net is made secure and rigid by Telstars fibre glass rod system for extra rigidity. The black pad and yellow enclosure will contrast superbly in your garden setting and finish the Orbit off superbly. Frame : 38mm x 1.5mm fully galvanised.